closets (or have a very small wardrobe) or live in a place where the climate stays the same year round, most women (and some men) have to do the seasonal wardrobe switch. I live in a house built in 1905, so you can imagine the closet space, and even in the newer upstairs addition, there's not much storage. No walk-ins, that's for sure! So, twice a year, the off-season clothes get bundled into plastic tubs in the attic. That's on my agenda for the coming weekend--the late date is astounding for Texas--usually it's the end of March, not the middle of May! We've had a very cool spring here. But it's not just the clothes that get a seasonal change--the house does, too. Out comes the sea-glass-blue runner for the dining room table, and the hurricanes filled with seashells and sea glass. In the living room, away go the heavy, furry throws and dark, velvety pillows. Out come the bright quilts and bird-printed cushions. A fun hour's work, and the house feels lighter and brighter. So my question, REDS, is whether you indulge in this seasonal pastime? And for the gentlemen among us, do you agree with my dear hubby? 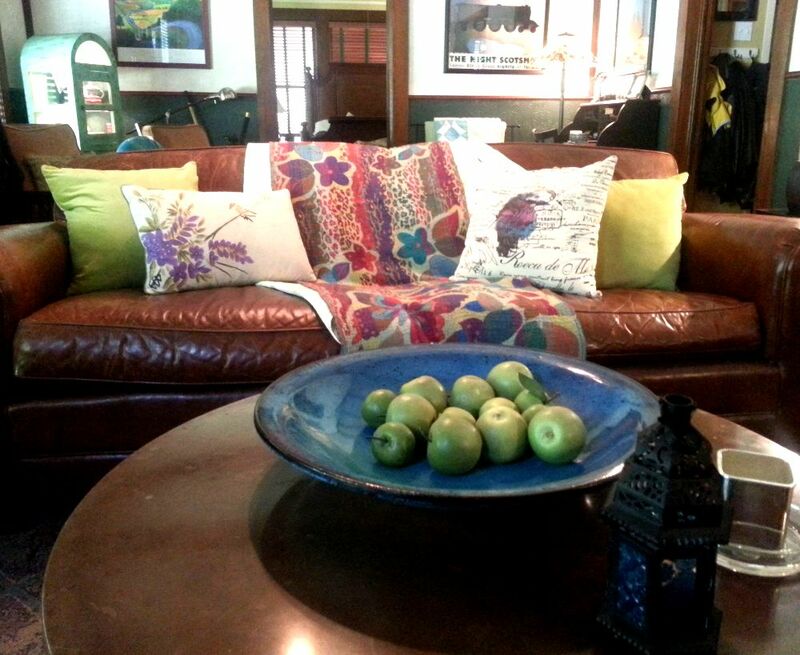 HANK PHILLIPPI RYAN: Oh, I completely change the throw pillows! (Debs, I will send photos) And the slipcovers on the sunroom couch. And the throw. I change the duvet cover on the bed from winter white to blue seersucker. Harley Jane Kozak taught me to change dishes, too...to use one set of dinner plates in the winter (more formal and serious) and a bright and sunny one in the summer. I love that idea! LUCY BURDETTE: Let's see, I did put away the Christmas throw pillows week before last. Does that count Debs? We are too busy working out in the vegetable garden to do much of anything, other than haul out the porch furniture and put up the screens. But I have to say that your bright quilted throws and bird pillows sound wonderful! ROSEMARY HARRIS: Ah yes! I can remember my mother changing the curtains three times a year and I swore I would never do that. But...I do a version of that. I have cotton curtains and velvet. Every year during the French Open I change the curtains. Sounds strange but in CT it's cool at night until late May. I'm a linens junkie so the bedding changes from velvets to matelasse to cotton matelasse to light cotton blankets. (Someone stop me before I go to Bed Bath and Beyond or Home Goods again...in Italy now and getting dangerously close to Frette and Pratesi. )The plants go out and so do we. The hundred or so cushions, throws, etc. are unearthed. The hammock comes out. The firewood gets used up or stashed elsewhere out of the living room. And don't get me started on all the outside stuff; plants on deck and porch and new hammock and new pillows (more throw pillows!) for the deck furniture. I move into the sunporch, even to write, and live in the room most of the summer. I want to hear about Hallie's summer food, and Ro's adventures in Firenze (and the linen shopping.) But in the meantime, although it would be nice if we all had winter cabins and summer beach front cottages, we'll make do. Well, we don’t change dishes . . . or pillows and slipcovers . . . or curtains . . . but we do take the heaviest quilt off the bed when it gets really hot . . . and we do plant the garden, add to the flower beds, and put pots of white petunias on the front porch . . . . If a throw pillow is what I think it is, we display the same ones all year. Actually, all century. Our dishes are the remains of four old sets, including a few I brought to the marriage 33 years ago. Our house gets made-over every Christmas, Easter, Halloween, and Thanksgiving, my wife loving holiday decorations, but spring is yard work. Oh, I did replace the bag of snow salt on my back porch with a Weber charcoal grill I winter in the garage. In New England it seemed very important to make seasonal changes from wooly warm stuff to light and airy stuff and from things that allow you to get wet to things that keep you dry. Your house made the appropriate transition taking its lead from your clothes. In Southern Arizona we have the monsoon season and the haboob season, neither of which deserve reflection in housewares or furnishings, although some things get an afterthought. "Oh, I should have closed the windows," or "Oh, didn't we have an umbrella," or on rare occasion, "I should have bought that coat while we were back home in Boston." ...okay...I periodically change the dishes but it's not a seasonal thing. Right now it's green majolica except for festive occasions, but Debs has me hankering to get out the Fiestaware! Love that stuff. And she's right it's so syummery...although we did just buy some cool plates and bowls near St Maria Novella. Jack...Larry David did a funny bit about guys and throw pillows a few years back. It's a girl thing, I think. I would like to be a person who does this. My grandmother was great at this. She switched out the dishes (including some silver pieces! ), rugs, runners, pillows, etc., when she opened up the sleeping porch on the first of May. I put "summer jammies for the kids" on the shopping list, but that's about as seasonal as I get. I love seasonal switcheroo (except for my closets which are too teeny to spit in! aargh!). I love taking the red flannel sheets off the bed for the last time and putting on high count white cotton sheets. Pulling off the heavy dark patchwork quilt comforter and replacing with the light weight patchwork quilt comforter that is different shades of whites and creams. Debs, this is taking place here a lot later this year than years past also. Here in Maryland, it seems like we go from cool 50s to sweltering 90s in the blink of an eye. So, yes, there is the need to switch out the clothes. (Not that many people notice since I have tons of orange clothes for both seasons, all they ever say is "How much orange do you own?" As for the dishes, we do have a few sets, but they are always in the cabinet, so I don't think we really "switch" them as much as just "choosing" different ones to use in the summer. Perfect timing for this post! I just finished going through the stored clothes bins, the closet and the drawers and donating all the winter clothes I manged to live without this past year.If it ever gets warm here in Rhode Island, I will put the surviving winter clothes into the bins as I take the shorts and tee shirts out. But those summer clothes are getting a purge, too! As for the indoor decor, the wool and fleece throws get cleaned and stored. The table runners and centerpieces are swapped for beachier things, the summery drinkware comes upstairs (yeah gin and tonics!) And more stuff gets stored - I want the house to feel more open and lighter. I'll revert to the cozy nest decor around Halloween. Seasonal wardrobes into bins twice a year Deb? And carted up and down the attic stairs? Wow. My seasonal clothes migrate to the other end of the closet and back again, all year long. (My house is 1933 and very small, but the bedroom closet is larger than the available storage space in the basement. But granted, I do haul the patio furniture on and off the deck as required. And I put Christmas decorations up in December. But seasonal throw cushions and such? Not so much. Like Hallie's dishes, where would I store them? Oh, thanks for the reminder, Jack, to get the salt bin and snow shovel put away. I think it's safe now. The only things I change are the quilts on the beds, and the table linens. When we remodeled the kitchen in 1998 I bought all cobalt blue Fiestaware, and it looks great all year, so no need to change. But my daughter, Queen of Throw Pillows to her bewildered husband, is constantly swapping out accessories. My mother does this heroic version of your clothing swap, Deb. She washes, irons and folds/hangs every single piece of clothing she's getting ready to store for six months. And then she washes, irons and folds/hangs every single piece of clothing she brings up from her basement out-of-season closet (that she had specially built). Even though she did all that when she changed it the last time. Never in a million years. Now that mid-May has arrived, like Kaye, we will pack away the flannel sheets and replace them with cotton, ditto for the flannel comforter. Our summer one is a riotous field of flowers, heavy on the poppies. Very summerlike. And this weekend the turtlenecks and corduroys I just stopped wearing (cold here in Maine, this spring, too) will go down to the basement in favor of shorts and summer tops, and I will swap the wool for the linen. Fleece is a year round fabric here, so it just stays right there in the closet, close at hand. We don't switch out the pillows or the dishware. But the pile of shoes outside the kitchen door changes -- boots disappear in favor of sandals and sneakers, and I just love that part. Yeah. I'm with Hallie. Sure, sweaters to the back, light tops to the front. Flannel off the bed, smooth cotton on. That's about it! But marinated fresh asparagus, cool spicy gazpacho, sliced local peaches, salads from the garden, gin and tonics? Give me warm weather! I am so cold in Massachusetts -- but today is starting to feel summery. I think we more "open up" the house -- the windows and doors, and extend ourselves to the outside. I am doing a switchover with clothes that is taking about six months! A Feb trip to Florida and an April trip west == combined with a cold New England spring --- well, let's just picture piles. I like the idea of changing the pillows in the living room (I'd have to get some first, which would be a great chore) since my living room is pretty static. (Except for Christmas) I do change the bedding in the master bedroom with the seasons--a fall outdoorsy bedspread followed by a Christmas quilt followed by an Art Nouveau spread followed by the flowery quilt then cotton blankets. I also like to change the kitchen dishtowels, tablecloths and napkins seasonally (darker in winter, brighter in summer). Susan D, fortunately, our attic is right across the hall from our upstairs bedroom. And I don't have that many clothes, so we're only talking two tubs here. Debs, I do the seasonal clothing switch, too, though I'm stuck in the middle this year because the weather keeps bouncing back and forth. I also switch bed linens and quilts. Until last year, I used to switch throw pillows, afghans, and quilts in the living room, as well as tablecloths/runners and chair cushions in the dining room, but writing and book promotion/touring has taken over my life. That didn't happen last year, and I'm not sure it will this year. But I want to bring that back, along with other things to bring my life back into balance. Dishes? They're all in the cupboards together, and I probably choose differently based on the season, but it's not a switch-out. But throw pillows? Many, many of them. They're a necessity, along with quilts and shawls/throws/afghans. I grew up in California, so I had no clue about the seasonal closet change. My first roomies in NYC educated me right quick. It seemed such a silly yet exotic ritual. Plus, they had lots of clothes. I still don't do the seasonal closet change. No need for it given my closet space and my smallish wardrobe. That said, I do have a winter bathrobe that I practically live in. So my season change consists of stashing that puppy away and pulling out my summer bathrobe. Oh, dear... now that I think about it, our throw pillow switcheroo is actually more a seasonally-induced recognition of the fact that the dogs have now taken *all* the throw pillows out through the doggie door to their fort in the ornamental grass, thus we need to get new throw pillows. "Something light and spring-y!" It is, however, an extraordinarily comfortable fort! Deb, sometime will you please write about lamps? I am assuming these lamps you've accumulated are not merely decorative but shed light by which to read. I have such a problem finding lamps, and would really love some tips on acquiring attractive, yet functional lamps. Here in coastal CT I'm still wearing my winter clothes to work and still have the lining in my winter coat. I hope to at least put the lining away by Memorial Day. This is the latest I've ever needed the lining. Usually the lining-less coat gets put away by late May. And the week before last I finally took down the last of the Christmas decorations! It was not a pleasant winter here-during the February blizzard our town had the most snow recorded-and I needed the extra color to cheer me up! A few years ago I started using the cheerier dishes all year long. I change to floral or white tablecloths for the warmer months. As I write this, I am home with a stomach bug. I don't usually get these in the spring. I am pretty peeved with Mother Nature this year! Oh, no, DebRo! That's no fun. Get better fast! Sending healing energy your way. It sounds wonderful. I think I need a full-time house manager. Does washing the windows count? and the curtains too. FRETTE! I love Frette, and bought towels when we were in Rome. But listen to this, and beware: You have to IRON them. Not in our house, gang. Yes, I change dishes. From white with green stripe to flowered. And hey, throw pillows are an easy way to change you room's outfit! Just like adding a scarf, right? We chose by random...let me know your info at h ryah at whdh dot com and I will get it to Kendel! I change bedding to lighter, summer quilts, change the throw pillows in the living room, even put out different decorations (more birds and nests, shells, flowers) for spring and summer. The entire front porch gets done, love to spend time out there reading. Used to have many, many sets of dishes (still love them) but sold several when I moved to Montana, so I no longer get to change for the seasons. It just makes it seem more "official", winter is over, though it was 36 degrees when I woke up this morning. Vickie! 36 degrees is unnatural for May! Thank you! My head is still fuzzy, probably from lack of sleep, but my stomach is better. Keep those good thoughts coming! I just opened the windows and it is NICE outside! I hope that means that Spring is taking her job seriously! Crowded House has a song "Four Seasons in One Day." I think we've been having that weather here in Maine. So I go from an electric blanket to opening the windows in less than 24 hours. I love linens! Along with writing instruments, they are my favorite things to shop for. Okay, books and purses are in that group, too. And shoes. Well...nevermind. I change the flannel sheets to the cotton sheets and I pack away sweaters because they take up so much room. But that's the extent of my seasonal changeover. I love the idea of summer dishes, though. I'm thinking of al fresco dining in Provence and the lovely printed tableware. Lovely. Sorry, the song is "Four Seasons in One Day." Kristi, I am SO THRILLED someone wants to know about lamps!!! By my spur of the moment estimate, I have about thirty.... Obviously, as far as I'm concerned, a house is not a home without lamps. (And no, they don't all stay on all the time, or our electric bill would be ginormous.) I'm always horrified when I walk into houses where there are only ceiling fixtures. It seems so... cold. And even more important, how do you read? Maybe I'll do a lamp post (couldn't resist the pun) when I'm up next time. Lamps!! I thought I was the Queen of Lamps! I may steal that post, Debs. I have a thing for lamps from the 40s - 60s. Some of them are pretty weird. Debs send me pix!